Khulna were bowled out for 137 in 18.1 overs. After their victory against Rajshahi Kings by 76 runs, Sylhet Sixers have now managed to roll over the Mahmudullah-led Khulna Titans at the Zahur Ahmed Chowdhury Stadium by 58 runs. Most importantly, with back-to-back victories, the Sixers also kept their hopes alive of qualifying for the playoffs in this edition’s Bangladesh Premier League (BPL) and move to the fifth spot, above Rajshahi Kings. The Sixers won the toss and didn’t have much hesitation to bat first. Liton Das and Afif Hossain got their team off to a blistering start with a stand of 71 runs from 47 balls. Left-arm spinner separated them by getting rid of Das, who scored 34 from 22 balls. Hossain, who was sent to open for the first time in this BPL, turned out up with an impressive 49 from 37 balls with the help of five fours and two sixes. Roy hit on straight down the throat of Junaid Khan at long on off Taijul Islam. Junaid was a tad expensive, having conceded 48 runs, but he accounted for the prized wicket of Nicholas Pooran. Nevertheless, Sabbir Rahman and Mohammad Nawaz put on 89 for the fifth wicket. 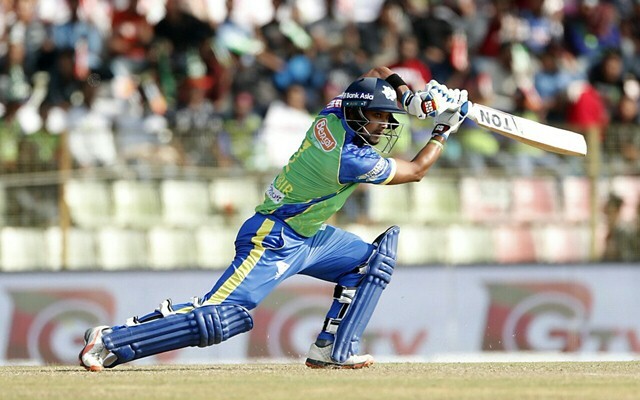 While Sabbir remained not out on 44 from 29 balls, Nawaz went on to notch 39 with three fours and two sixes. Brendan Taylor and Junaid Siddique started the Titans’ run-chase in an attacking manner, but Taskin Ahmed struck first blood in the third over with the wicket of Siddique. Al Amin perished after promising with a couple of sixes to score 16. Alok Kapali picked up the third wicket in the form of Nazmul Hossain Shanto. Fast bowler Ebadat Hossain delivered the body blow with skipper Mahmudullah’s wicket in the 13th over. Jason Roy took a stunning catch in the deep to dismiss Taylor, who racked up 34 from 23 balls. Ariful Haque tried his heart out with a 21-ball 24, however, the Sixers didn’t allow the Titans to get a foothold back into the match. In the end, Khulna were bowled out for 137 in 18.1 overs. Left-arm spinner Nabil Samad was the Sixers’ most successful bowler with three crucial wickets. Junaid Siddiqui has no score of single digit in the 10 matches he has played in this BPL. But at the same time he’ll also be disappointed that he couldn’t capitalise on his starts in most occasions. LOL this #BPL2019 is incredible. 88 runs of the last six overs. And that too after a mini collapse.
" Alok Kapali " you beauty. @SylhetSixers need to make him captain first of the season.Not only he had good overseas players now but also he had good experience where,which bowlers need to use. @Official_BPLT20. Thank you Alok Kapali . Ridiculous from Brendan Taylor. Was he sleeping? The impact was easily outside leg. Can't he even ask a Junior guy to go for review?